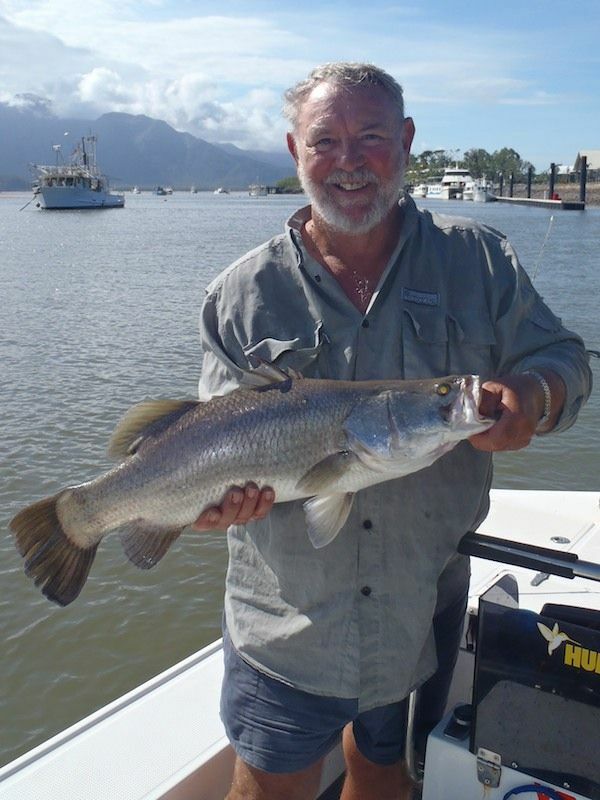 Yesterday Dad and I went on a fishing expedition up to Hinchinbrook with GandT Fishing School proprietor Graham Knight (forum member Knighty). 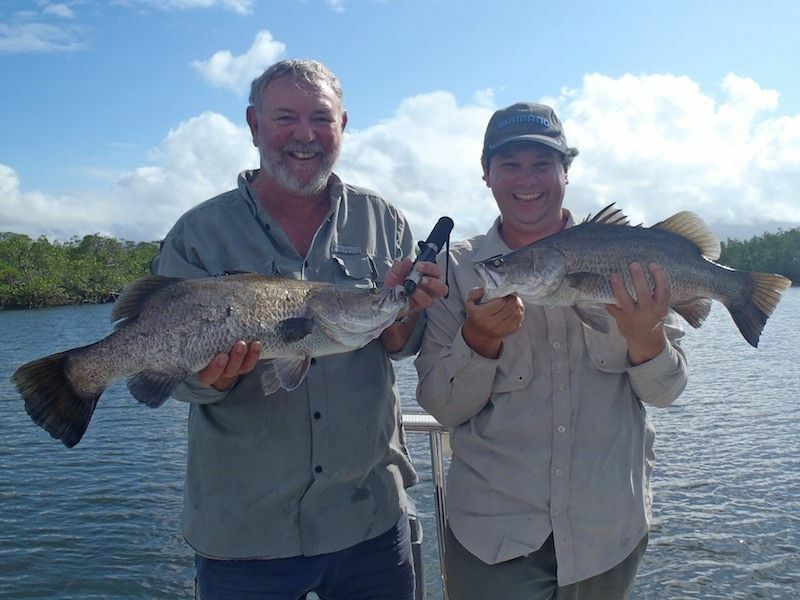 Graham and I have been planning a fishing trip together for several weeks now, and with the recent success he has been having with his clients up the channel, it was a no brainer to head back up there. We left Grahams place about 5am with his beautifully decked out 6m glass flats boat in tow. On the water at 6.30am it was then a long run up the channel to where we wanted to fish. Luckily his boat does 30knots quite easily! We started drifting the edge of a small creek working toward where Graham anticipated the fish to be sitting. But without his usual hand remote for the 80lb iPilot electric, Graham was getting slightly annoyed working into the current with just the foot controller. 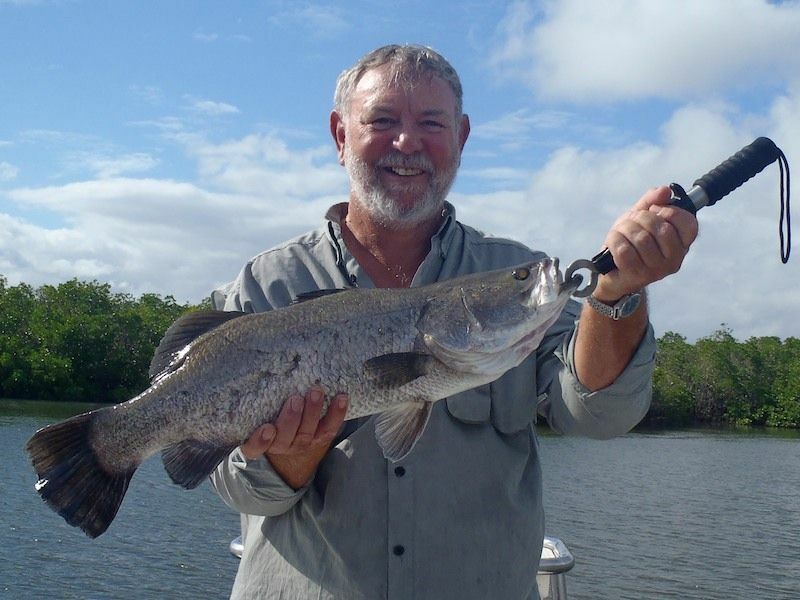 So with nothing more than a small Barracouda attacking our lures the decision was made to pull the electric and head upstream and work back with the tide. As we drifted slowly with the tide we entered a small creek mouth and worked our lures around the pressure points. This was where we saw our first Barra. A big fish took a swipe at my 4in prong right beside the boat! He missed the hook, but got the adrenaline pumping. A few more casts in this area and I was on. I didn't even see the take. One minute I was watching my prong in the clear water, and next thing I couldn't see it any more! Thumb on the spool of the Chronarch and 30lb Power Pro held to pull the fish from the snags. A short fight from here and we had our first Barra in the boat. At 71cm it was to hold the the 'biggest fish' title for most of the day. We had several more hits, flashes and missed hookups before Dad nails his first for the day. Although it was a little unorthodox! A solid fish, it took him straight into the snags. We could see the fish still attached and Dad could feel it surging on the end of the line. So in Graham goes with the boat! Several attempts fail to get the fish to swim back under the snag, so plan B was to grab the fish by the tail and haul it over the side while Dad gives some slack! Success, Dad has his first of the day to the boat. Thanks Graham! Graham, not to be outdone by his visitors to the boat, was next to hook up. This time on a small Hard Bodied lure. I tried to get a little video footage, and almost lost the fish on him while trying to film with the camera in one had and net the fish with the other. But somehow it all came together and fish number 3 was in the boat. 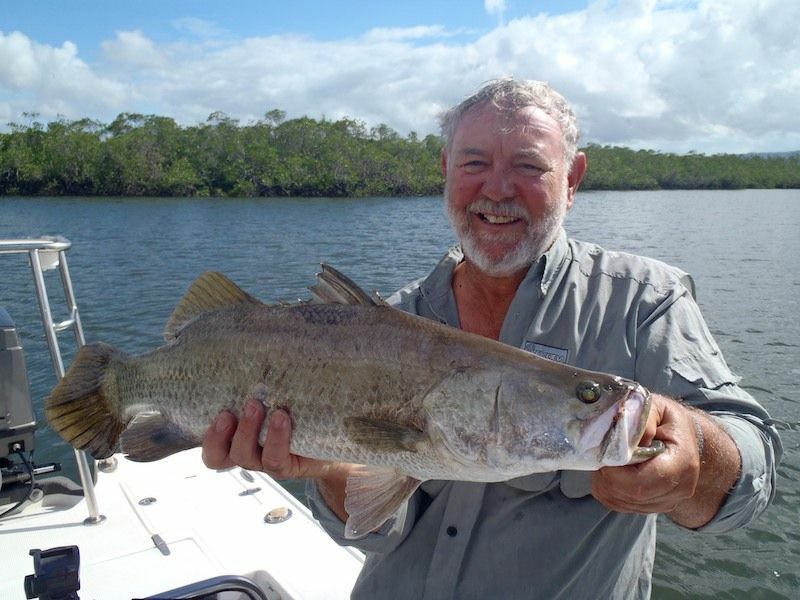 Dad's next fish was a carbon copy of his first! Straight into the snags. Well, back in we go. A little mucking about and few broken mangrove roots and the fish swims free. After the fish is boated both Graham and I start yelling to Dad "MORE DRAG...MORE DRAG". We continued to boat fish after fish during what was supposed to be the quiet period of the incoming tide. 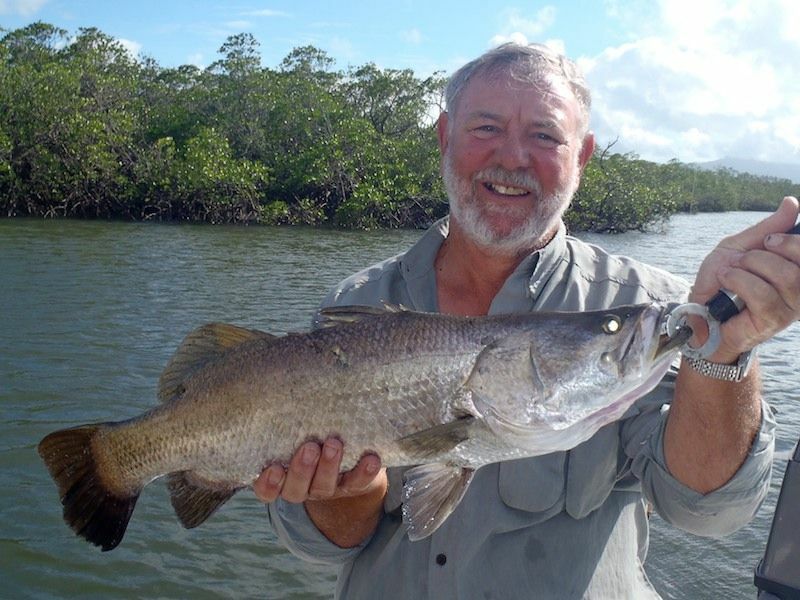 Graham had indicated earlier that fishing would be slow as tide rose, but the bite would improve on the falling tide. Wow, we had just experience a pretty good session on incoming, and were keen to see this 'hot bite' the falling tide was to bring! As the tide topped out the fish did go off the chew. So we looked around a couple of other creeks and had some lunch and a rest. I changed over from the 4in Prongs on 30lb and pulled out the Stella 1000fe with 8lb. I put on a 3in Prong and Graham says "what are chasing there?". "Bream" I said. 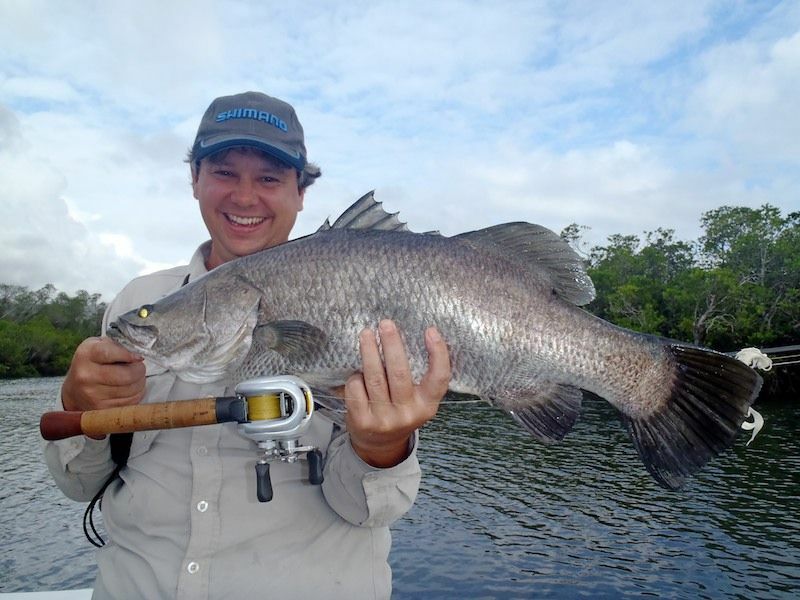 "What are you chasing Bream for when there are Barra all over the place?". "Well, its gone a bit quiet, though I might chase something else". 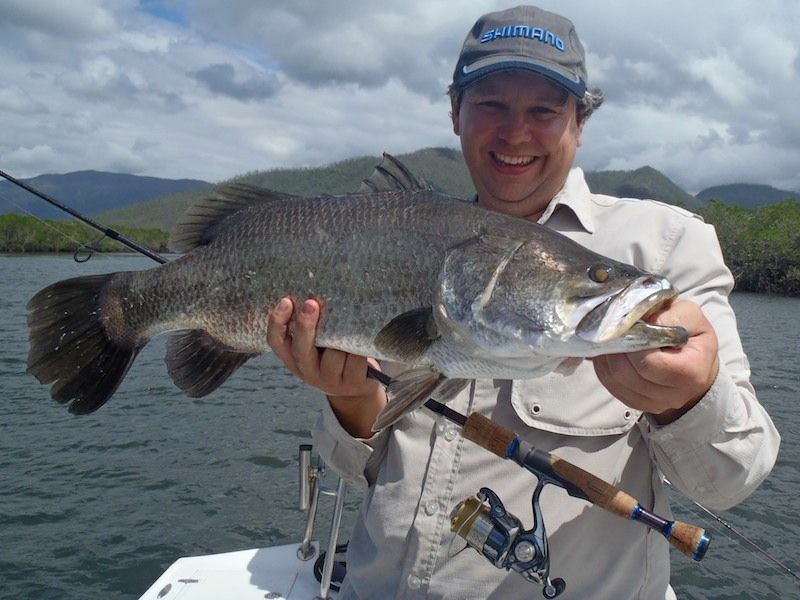 But I was really keen to have a go at a bigger Barra on the light gear! The tide eventually changed and we headed back to the secret spot. Almost immediately Dad hooked and boated another fine specimen. Then I hooked up a solid fish on the light gear. Maximum pressure on the 8lb and I had his head pointing at clear water. But the hooks pulled and fish won his freedom. I was a bit annoyed as the fish had been pulled clear of the snags and should have been an easy capture from there. "That will teach you to use the small prongs and smaller hooks" was the response from someone else in the boat. But revenge is sweet!! A few casts later and I am hooked up again to a solid fish. Full pressure on the line and some good electric work from Graham sees the Barra come clear of the dangerous snags. In open water the fish works me hard. "Take it easy" says Knighty "We have all day". "Not with a 20lb leader!" I responded. But after some very tense moments the fish is cleanly in the net. At 75cm this was now the biggest fish of the day, and it was to stay that way too! So after a little bagging from the boys the 3in prong and 8lb Stella landed the biggest fish of the session. But I had pushed my luck enough, back to the Chronarch and 30lb! And a good thing I did too, my next fish was what I called 'the 2 second fish'. Hookup and bust off all in less than the blink of an eye! He grabbed my prong, went under a snag, jumped on the other side and busted me off at the leader, all in under 2 seconds. "Was that the light gear" says Dad. "Um, no" I responded. Good thing too, I would not have lived that one down! A few more fish for the afternoon and we were stuffed. Time to call it a day. We raced back down the channel at 25knots and once back in Dungeness Graham says "so do you want call it a day or go looking for a Jack?". We didn't have to be asked twice, so we headed up past the ramp to the first run of snags. 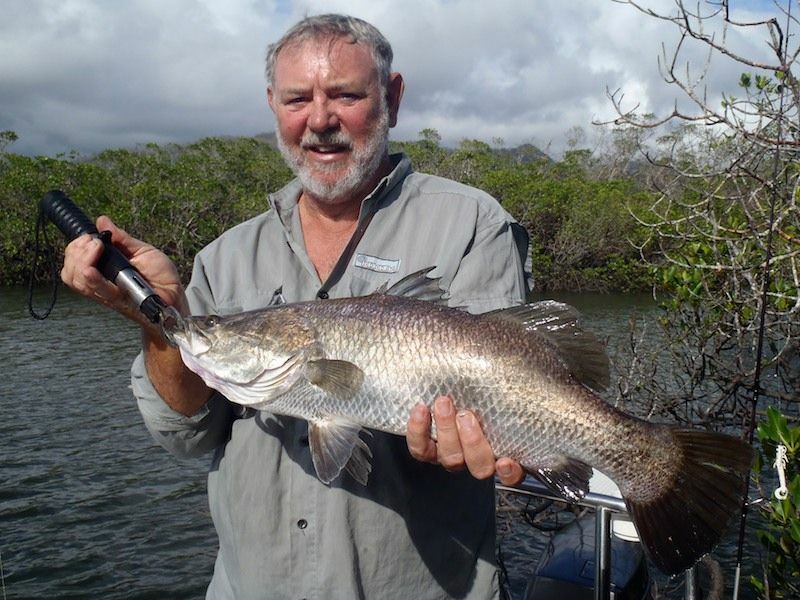 I missed a fish and boated a 55cm Barra before Dad hooks his best fish of the day. Its nice to see a fat healthy fish jumping clear of the water with Dungeness harbour int he background. In the net and this one goes 67cm and is the only non farm fish of the day! 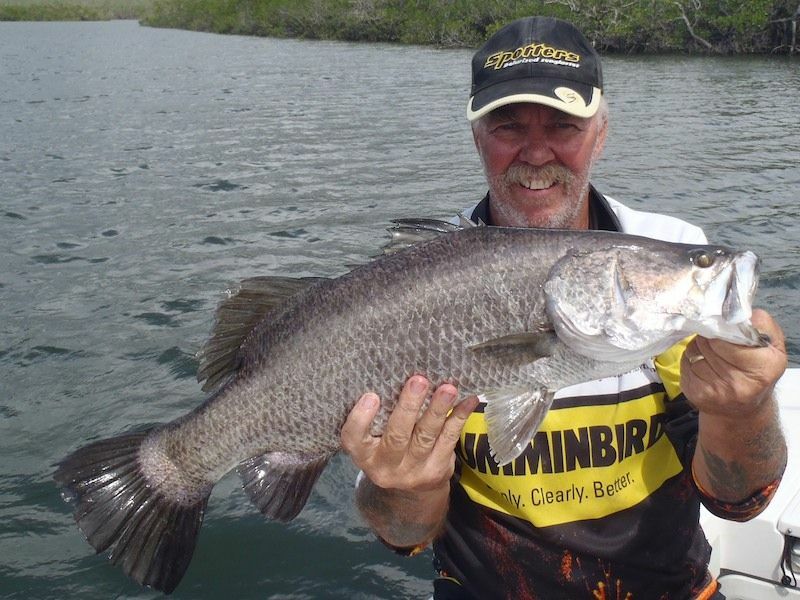 In all we boated well over 20 Barramundi. 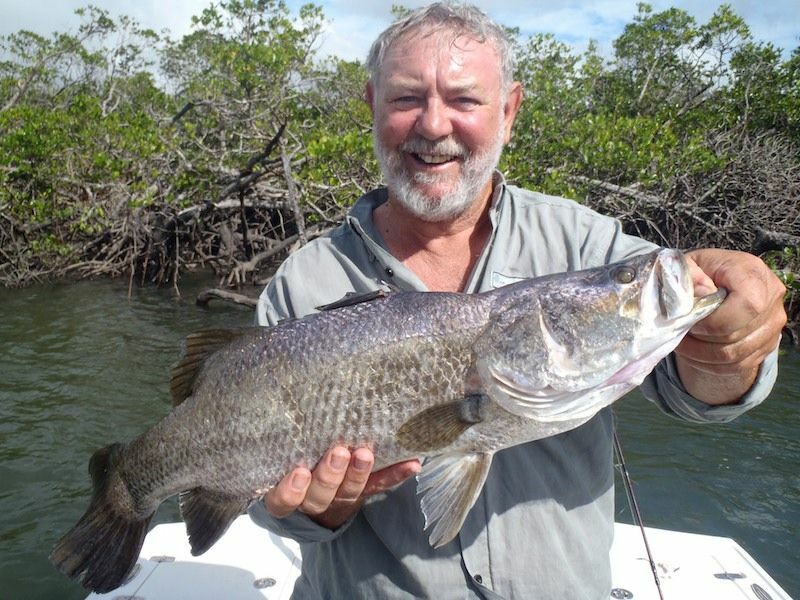 Of these 15 or more were leal fish, 12 over 60cm and 2 over 70cm. Not a bad effort with lots of other hits, flashes, jump offs and hooks thrown. By far the 4in Prong in white rigged weedless as shown here was the lure of the day. We had fish come back for two and three goes at the lure. You don't often find that with Hard Bodies. 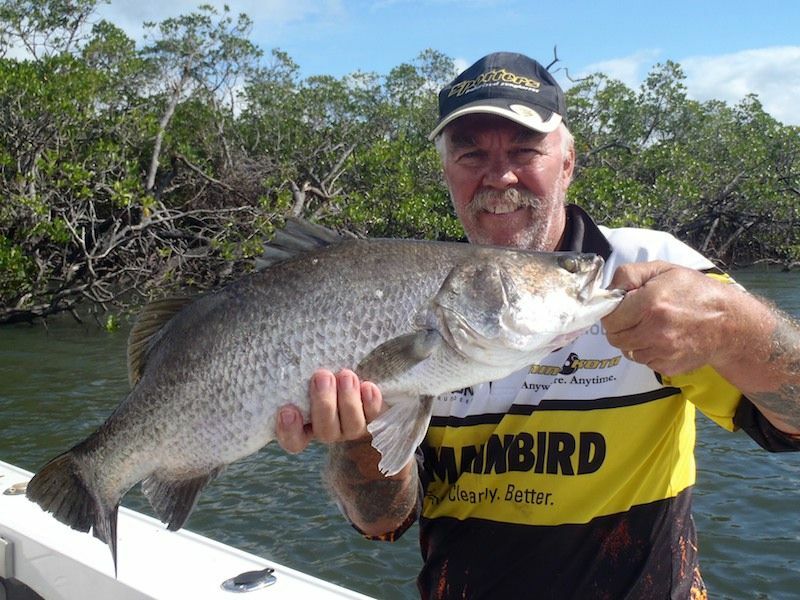 Graham really does know his stuff when it comes to targeting Barramundi on lures. If you want to charter him for a session like we had then visit his website and get in and make a booking. 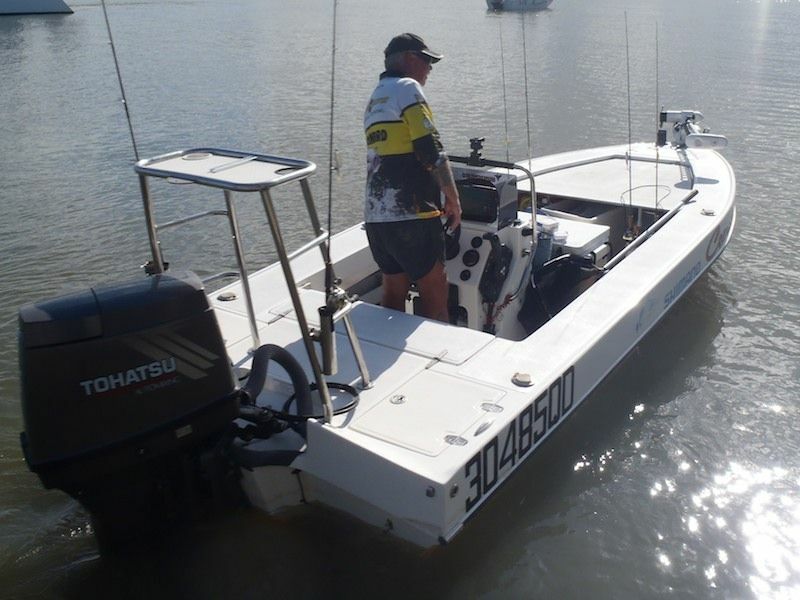 He uses nothing but the best gear, his boat is set up like no other and his attitude and professionalism is spot on. You will have the time of your life. Here is a little video footage form the day. Its a bit rough, but good enough to get an idea.